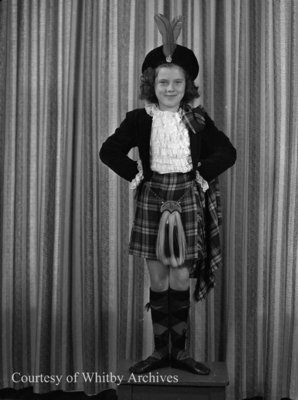 A black and white large format negative of a young girl posing in her Scottish highland dance costume. In this view she is standing on a stool facing the photographer with her hands on her hips. The negative envelope indicates her last name as Kerr. Kerr Child, May 1947, Marjorie Ruddy. Whitby Archives, A2013_040_513.